Discovered and claimed by Portugal in the late 15th century, the islands' sugar-based economy gave way to coffee and cocoa in the 19th century - all grown with plantation slave labor, a form of which lingered into the 20th century. While independence was achieved in 1975, democratic reforms were not instituted until the late 1980s. The country held its first free elections in 1991, but frequent internal wrangling between the various political party's precipitated repeated changes in leadership and two failed coup attempts in 1995 and 2003. The recent discovery of oil in the Gulf of Guinea promises to attract increased attention to the small island nation. 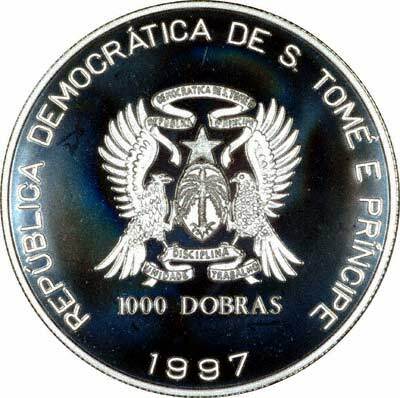 For silver and base metal coins of São Tomé and Príncipe, please look at our original Chard Coins website. We make an active market in almost all world coins, gold or otherwise, including São Tomé and Príncipe gold coins. If you have any of these coins to sell, please contact us, or post them to us for appraisal and offer.